Recently, graphic designer and blogger Todd Radom did a great article about the history of the Baltimore Orioles' cartoon "Swinging Bird" mascot. I'd previously known about the history of James Hartzell's bird who graced the 1954 logo and appeared daily on the front page of the Baltimore Sun to quickly illustrate whether the O's had won or lost the night before. And I'd known about Mike Ricigliano, the cartoonist who brought the tradition back in 2009. Paul Carlson's original drawing of The Bird. What I wouldn't give for that framed in my den! Anyway, on to the 2014 animation! 2010 brought the original stop motion Bird animation. 2013 brought Oriole Park at Cardboard Yards set into the mix. For 2014, I wanted to animate more things that the costumed Orioles mascot couldn't do in real life: wardrobe changes, stunts, different environments, and crazy vehicles. As with the previous Orioles stop motion animation, I collaborated with John Sumner who created all of the incredible sets and the majority of the props. (Although I did get in on some of the prop-building this year!) Costumes were all created by Season Mustful who really brought her A-game on this! The first new animation of 2014 was a new Home Run train. 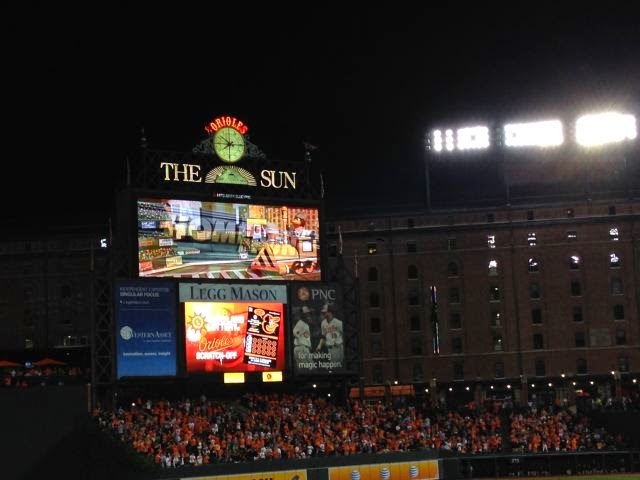 The Orioles used to actually have an old animation of The Bird conducting a train for home runs that they showed on the old dot-matrix scoreboard in the 90s. Not sure if anyone else remembers this, but I wanted to do an updated version of it. The second animation played with a simple pun. Get it? In the third animation, The Bird finally got to leave the confines of Oriole Park, dressed as a daredevil similar to Evel Knievel. For the final animation of the season, I wanted to do a "Make Some Noise!" spot. What could be louder than a construction worker with a jackhammer? (Answer: Orioles fans in October baseball.) Funny enough, there was some jackhammering going on outside of my studio as I was animating this! Thanks to all the great people at Orioles Productions for being awesome! Looks great as usual, Pete! Pete, thank you so much for all of your hard work. 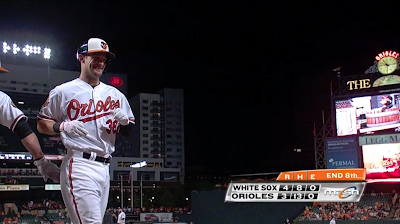 You made games at Oriole Park a bit more fun this year. The jackhammer was my sister's favorite - she loves the zoom in on the Bird's wide "crazy eyes"! Thanks, Mark! Literally working on a new batch of these RIGHT NOW.